They were young Jewish boys who escaped from Nazi-occupied Europe and resettled in America. After the United States entered the war, they returned to fight for their adopted homeland and for the families they had left behind. Their stories tell the tale of one of the U.S. Army’s greatest secret weapons. Sons and Soldiers begins during the menacing rise of Hitler’s Nazi party, as Jewish families were trying des-perately to get out of Europe. 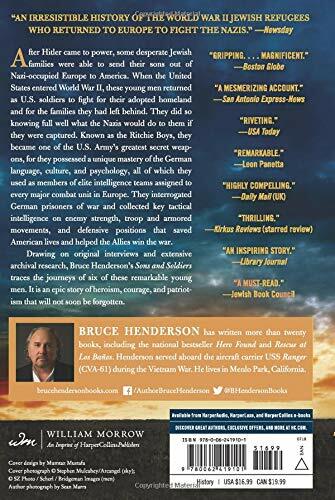 Bestselling author Bruce Henderson captures the heartbreaking stories of parents choosing to send their young sons away to uncertain futures in America, perhaps never to see them again. As these boys became young men, they were determined to join the fight in Europe. Henderson describes how they were recruited into the U.S. Army and how their unique mastery of the German language and psychology was put to use to interrogate German prisoners of war. These young men—known as the Ritchie Boys, after the Maryland camp where they trained—knew what the Nazis would do to them if they were captured. Yet they leapt at the opportunity to be sent in small, elite teams to join every major combat unit in Europe, where they collected key tactical intelligence on enemy strength, troop and armored movements, and defensive positions that saved American lives and helped win the war. A postwar army report found that nearly 60 percent of the credible intelligence gathered in Europe came from the Ritchie Boys. 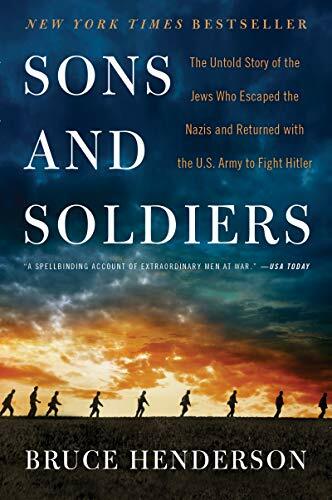 Sons and Soldiers draws on original interviews and extensive archival research to vividly re-create the stories of six of these men, tracing their journeys from childhood through their escapes from Europe, their feats and sacri-fices during the war, and finally their desperate attempts to find their missing loved ones. Sons and Soldiers is an epic story of heroism, courage, and patriotism that will not soon be forgotten.